I just got my copy of Call Of Duty: Black Ops, third person to purchase it at the store, I've been waiting and itching to play and write this review for quite awhile now. Alright, let's get to it, first off, the game throws you into a pretty vague scene wherein you don't really know what's going on but as you wait, things start becoming clearer. I can already feel the tension of the story as the beginning unfolds, as a matter of fact, you already get a faint hint as to what to expect by sticking around the main menu screen for awhile. There's a more serious vibe of suspense and a dark intrigue around this game, which is to be expected based on the plot of the game which generally revolves around the Cold War/Vietnam War era and the conspiracy and things that happened "behind the scenes" during the that was kept hidden from the general public. The first area of the campaign already gives you a taste of things to come later in the game, it kicks off with the usual "simple get acquainted/re-acquainted with controls" type of level where you're given a bunch of enemies to practice on, but without sacrificing the solid storyline of course, kudos to the developers for keeping things interesting right off the bat, because personally, I didn't like how Modern Warfare and Modern Warfare 2 began, the whole camp and training course thing (of course the rest of the campaign made up for that). The cutscenes are also well structured and created, a good mix of realistic aspects and digitally created aspects, very visually appealing and adds to the suspense, at one point, I was actually reminded of Assassin's Creed because of the way the cutscenes were used to help tell the story. Another feature I found cool was that they included Zombie mode in this game, kinda like Left 4 Dead but Call of Duty style, at least there's a fun a pastime aside from the main features of the game itself (campaign and multiplayer). Moving on to the gameplay, if you've played Call Of Duty Modern Warfare/Modern Warfare 2 or any Call Of Duty game for that matter, then you should have no problem adjusting to this game, everything is pretty much the same, controller mapping, movement, etc. The game gives you diverse level of sensitivity which is always a great touch, it makes things more personal because not everyone uses the same aim/look speed. The aiming mechanism is simple and accurate as usual, which provides easy target acquisition and decent hip fire capability. And you can't forget the "cutscene-within-gameplay" scenes where there are some epic "movie" moments embedded in the actual gameplay, one of my favorite features. The campaign soundtrack is pretty awesome too, although not as epic as the soundtrack of Modern Warfare 2 (Hans Zimmer rules), it's still quite good , fitting to the scenarios and events that are present throughout the game. The voiceovers are star-studded too with celebrities like Sam Worthington, Ed Harris, Gary Oldman, Ice Cube (I knew this was him as soon as his character spoke. Haha. ), Emmanuelle Chriqui, Topher Grace, Oleg Taktarov, all lending their voices to add to the epic-ness of this game, in addition to them lending their voices, some of the characters actually look like the real life actors whose voices are in use! 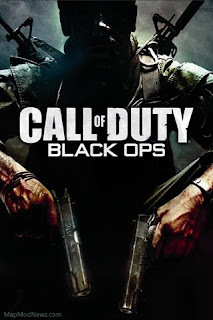 We all know how highly acclaimed the Call Of Duty franchise is when it comes to Multiplayer, when Modern Warfare 2 came out, the multiplayer was instantly addictive. But if you thought Modern Warfare 2 was addictive, wait until you see what Black Ops has in store for you in terms of multiplayer. To get the ball rolling, what basically happened was that the developers kept the basic multiplayer aspects of the game that most people accustomed to and then added some pretty sweet stuff to the already saccharine coated multiplayer component of the game. But before getting into that, one distinct feature that was added to the game is a form of currency called CoD Points, I think this is an awesome touch to throw in because it opens up a whole new avenue of opportunities! This currency enables a player to purchase weapons, attachments, perks, equipment, grenades, etc. This adds a bit of a challenge to the game because unlike Modern Warfare 2, you gain firepower simply by leveling up, in the case of Black Ops, you do gain access to firearms as you level up but you can't just equip them, you now have to purchase them, not only that, but you also have to purchase every other aspect that makes up your personal arsenal, from attachments, to equipment, to perks. This adds a little "economic equilibrium" to the game because in order to earn, you need to play, kill, level up, pretty much do what you do and get "paid" for it. Okay, before you whip out your credit cards, CoD points cannot be purchased with real money, come on people, really? How desperate are you? Haha. Another nice add on is the "Contracts" aspect of the game where you can use your CoD currency to purchase contracts that have specific requirements, you fulfill them, you get the monetary/experience award. There are three categories: Mercenary, Operations and Specialists, I'll leave it up to you to play and explore these categories, see where you fit best. Aside from that, there are some pretty cool killstreaks added such as RC-XD (Remote Controlled Car with explosives), the Attack Dogs killstreak and the SR-71 Blackbird killstreak. There is also an add on that players can utilize as a "practice" match of sorts, it's called Combat Training wherein you set the AI difficulty and play against bots in an independently progressing mulitplayer aspect, meaning what happens in Combat Training, stays there. 1. One In The Chamber: It's sort of like a Mexican Standoff wherein each player has a pistol with only one bullet in the chamber, you shoot an enemy, he dies, you get another bullet, you miss and you're left with a knife. 2. Gun Game: Everyone starts with pistols, each kill you get upgrades your weapon and you move on to the next level (20 Levels total), so it's a hierarchical path from pistols, to submachine guns and so forth. First to get a kill with every weapon wins. 3. Sharpshooter: All players begin with a randomly generated weapon, the same random weapon for all players, then every 45 seconds, the weapons change at random again. A true test of one's versatility with firearms in the game, if you want to win, you need to be a jack of all trades, the same tip goes for Gun Game. 4. Sticks And Stones: Each player starts with a crossbow, a ballistic knife and a tomahawk, whoever dies by tomahawk goes broke. Another unique feature added here was the high level of character customization, you can customize pretty much everything, from decals and logos on your weapon, to face paint, it seems like a very vast range of player customization combinations which leaves a lot of room for the imaginative and the artsy. So in summary, if you're an FPS junkie and firearms enthusiast like myself and you've liked the previous games from the Call Of Duty franchise, especially Modern Warfare 2, then you're going to have to get this game, well worth buying and spending a whole lot of time on. Overall: I think this game deserves a 9.5/10. To put it simply: Great story, great gameplay, beautiful graphics = a really awesome Call Of Duty game.